Our event began with a thunderstorm followed by continuous rain. Nonetheless, our EV enthusiasts joined us with smiles and heart-warming enthusiasm - not allowing the inclement weather to deter their plans to gather with one another and educate the public about the benefits of driving electric! Although only one local car dealership braved the rain, people lined up with umbrellas to enjoy their test drives in a Nissan Leaf. Nothing short of a Florida hurricane would have discouraged the folks who joined us at our NDEW event!! Heartfelt gratitude to everyone who made this happen!! 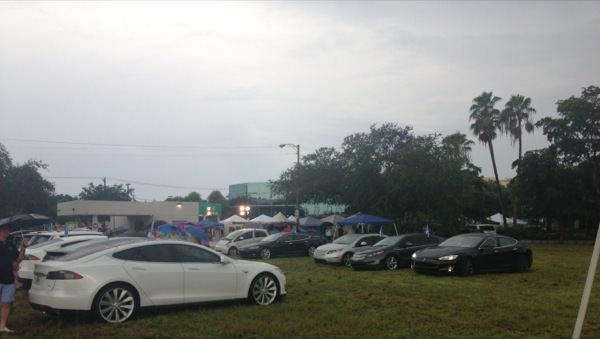 Plug-in Electric vehicles in the rain. Fusing Arts, Small Business, Community & Sustainability. Night Owl Market and Drive Electric are Carpooling This Year! Hello, South Florida! 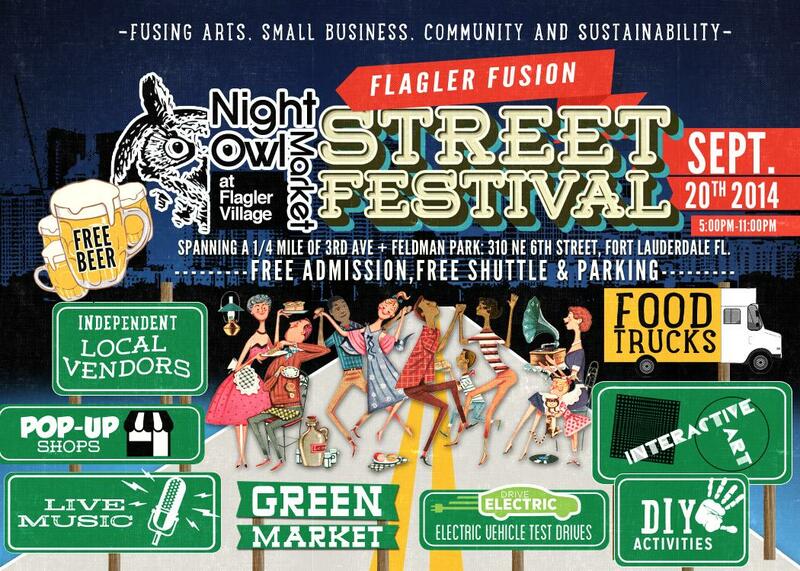 Join us on September 20th from 5pm-11pm for Night Owl Market; a Flagler Fusion Street Festival! Celebrate National Drive Electric Week with a night of test drives, food, music, shopping and fun! • Talk With Local Dealerships to Find the Best Electric Vehicle for You! • Artisan Treats: Baked Goods, Fine Chocolates... even treats for your pup! • Vegan Options: Veggie Dogs, Vegan Cupcakes and More! • Electric Vehicle Ride and Drive Opportunities - Various Models From Local Dealerships! 5-8pm! • Goodbye Gas; See Why We're Plugging In! Eat, Shop, Support & Mingle. NOM will span a quarter mile in length, on 3rd Ave. between 5th and 7th street in downtown Fort Lauderdale, as well as Feldman Park! Join us between 5pm-11pm for an evening of fun! Free Admission ll Free Parking & Free Continuous Shuttle Service! Questions? Call us anytime! 954-785-7475. Call **EVENTINFO for more Parking Details! Here in Flagler Village, we love living green! Night Owl Market celebrates the fusion of art, small business, community and sustainability within South Florida. Working with the Flagler Village Civic Association, one of our major initiatives within the event is to promote the various sustainable amenities within Flagler, including: an upcoming community garden, Flagler Farm and cropsharing, the launch of a monthly green market, LEED certified buildings, charging station installments, way-finding initiatives and more. The push for electric vehicles is something we can certainly get behind, so naturally, we're excited to take part in Drive Electric Week! Electric Vehicles are cheaper to fuel, cheaper to maintain, less polluting... and cool! Meet with us on the 20th to learn more! 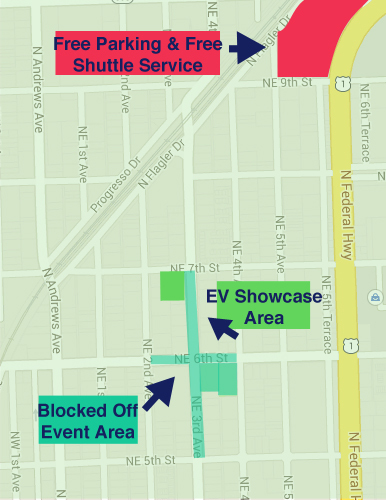 Electric Vehicle owners: Meet with like minded enthusiasts, check out various models, show off your 'sweet ride' in the special showcase area, and spread the word to new enthusiasts! See you on the 20th for a great time! There are currently 342 attendees registered. Registered attendees report 590,404 electric miles driven.